For the past two years I’ve had quite the cruisey December. So much so, I kind of assumed everyone else was having the same kind of nice time. Turns out – not so, given I’ve recently been asked by four different publications/podcasts for my thoughts around having a less frantic December. Today I thought I’d summarise the things I shared with them. Here are my best tips for making the run into the end of the year as chilled as possible. If you’re reading this in November, great, because that’s what’s going to give maximum ability to set up your December! The car park rage at having someone slip in and steal your parking spot after you’ve been waiting not-so-patiently for 10 minutes. The ridiculously long line at the checkouts. The sheer volume of people who are seriously on edge – and the angsty energy that goes with that. 1. 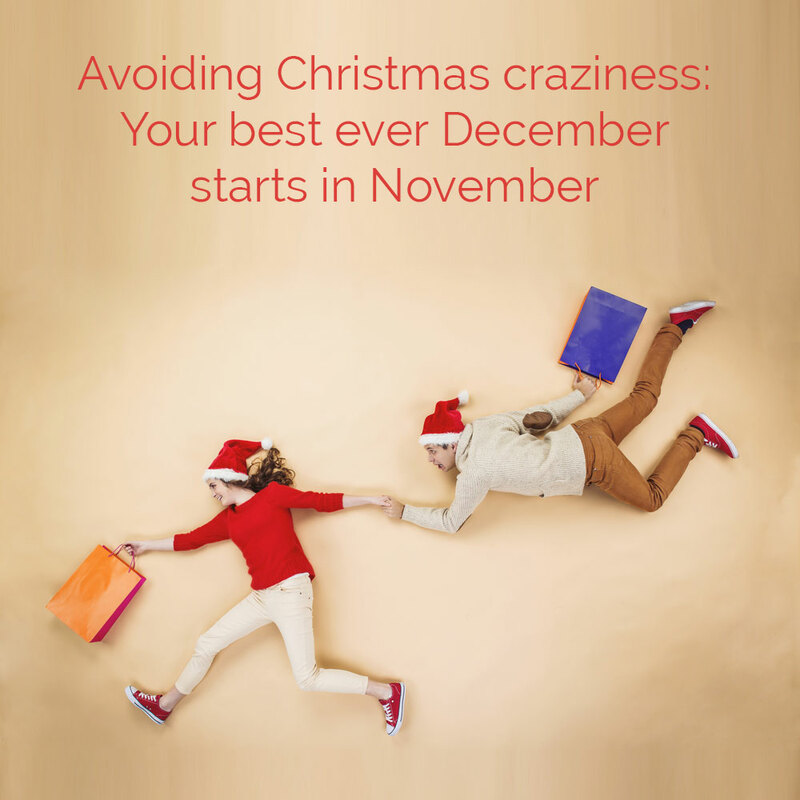 Do all your Christmas shopping in November. Yes, that’s right now. This current month. Most people are denial about Christmas in November which is why it’s perfect present buying time. So make your list, make some notes about what you might like to get each person, and then hit the shops with a plan of attack (i.e. I’ll get Johnny, Lizzy and Gary’s presents from Target, Mum and Dad from Dymocks, Suzy and Jenny from Pumpkin Patch etc). There is no reason why you can’t knock off your entire list in one afternoon with this approach. If you find yourself particularly stuck with certain people – buy them a voucher so they can take advantage of the great discounts in the after-Christmas sales. Or buy them an experience like movie tickets. And keep in mind you don’t HAVE to buy your Christmas presents from a major shopping centre. Why not buy online from small independent retailers. Like my friend Amy. That way, you don’t have to go to the shops at all! I’ve been doing my food shopping online for years and I’ve you’ve never tried it, this is a good time to start. If you’ve done all your Christmas shopping in November, and you do your food shopping online, that means even if you run out of something you can run down to your local IGA or fresh provisions store rather than needing to go a major centre. Ah yes – those people we’ve not managed to catch up with all year. All of the sudden December is on the horizon and we’re saying things like ‘We must catch up before Christmas’. Why? Why set yourself up for Saturdays where you are going from one engagement to another and just as you’ve settled into one you have to hustle and get everyone in the car to get them to another place? It’s just crazy. If we’ve not seen each other all year, we can catch up in that break between Christmas and the New Year. Or, even better, January. No more than one engagement per weekend ‘day’. i.e. Friday night, Saturday and Sunday. I actually aim to keep one weekend day each weekend in December completely free of plans. This gives us the flexibility to spontaneously catch up with someone we see out and about if we want to. Or go home and have a nap if we need too. Catch up for walks rather than a coffee or drinks. Walks are great. You don’t have to get dressed up. You can meet at someone’s house, or a mutually convenient location. You can walk with a coffee in your hand. You’re getting exercise at the same time. And walks don’t accidentally turn into boozy all-nighters. Eat off a smaller plate. Yep, that’s it. Fill the small plate and eat just what can fit on there. The amount you fit on there will be enough to make you feel full – but not overstuffed. And yes, have dessert. But just one serve ok? Space alcoholic drinks with something like a soda, lime and bitters – something this is refreshing, hydrating … and can pass off as a vodka, lime and soda if your peers have a need for you to keep up with the alcohol they’re consuming. Where possible, stay away from pre-mixed drinks, diet sodas and full sugar sodas at this time of year. Stick with low carbohydrate beer, wine, champagne, spirits mixed with soda water, or spirits neat. I also find it useful to do a bit of a ‘spring clean’ of my system in November. The program I do is this one. It goes for 21 days and I find it refreshes my eating habits and means I enter December feeling healthy and good about myself – and less inclined to treat my body badly by filling it with crap. 20 minutes a day. That’s all. And it doesn’t even need to be all at once. Just move your body each day as this will help keep your mind in a non-frazzled state. Remember all those people who want to catch up with you? Like I said before – catch up with them for a walk. Two birds with one stone. Perfect. Sending real Christmas Cards is nice isn’t it? People love getting those in the mail. But finding a time to get the family looking nice so you can take a picture, takes a bit of doing. How about this instead: wait until Christmas Day when you’re already all going to be in the same place at the same time AND looking nice, and take the picture there. Then, in January when things are a little less crazy and you actually have the headspace to write a nice, personal note to friends and family, send out ‘Happy New Year’ cards. Face it, the end of the year is filled with irritations. Your racist uncle at Christmas lunch. The person who just cut in front of you at the checkout. The old family friend who just cannot see anything good in the world. Here’s a promise I want you to make to yourself in November (so you have time to practice before the sheer volume of irritations makes it hard). Don’t ‘pick your battles’ at this time of year. Simply refuse to battle. You’re going to come into contact with so many people and situations that are not part of the rest of your year. The energy you’re going to waste trying to change their mind about something they’re never going to change? Not worth it. The chilled out state of mind you’ll achieve by refusing to engage? Totally worth it.